Pitchers of all ages should do what they can to watch Tom Glavine pitch at least a few times this year. Glavine has been, and remains, the consummate pitcher’s pitcher — a guy who relies on guile rather than overpowering stuff to succeed. Glavine never threw very hard — even in his youth — and now tops out around 85-87 MPH with his best fastball. Yet, he continues to get big-league hitters out on a consistent basis. More importantly, he does everything in his power to help his team win — on the mound, as a fielder, and on offense. Many more talented hurlers spend less time on the “other” aspects of pitching — i.e., holding runners on, fielding, bunting, etc. — and therefore rely solely on their ability to dominate hitters. While this approach can work, it’s a much better plan for a pitcher to work on all aspects of his game involvement. Glavine is proficient in every area of a pitcher’s responsibility, and as a result helps his team win even when his pitching is sub-par. Simple, Repeatable Motion – There are no herky-jerky motions, or complicated hand movements, in Tom Glavine’s delivery. His mechanics are simple, easy, balanced, and as smooth as butter. Glavine uses four “checkpoints” in his delivery — certain spots in his motion that he’s aware of where his body, weight, and the ball need to be. Very little can go wrong with the simplicity of his mechanics, and as a result his delivery is easily repeatable, and not strenuous. This is the key to consistent command of your pitches and in dominating the strike zone: to repeat your mechanics. 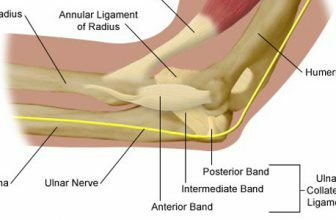 If your body moves in the exact same way every time you throw the baseball, you have a much better chance of putting the ball exactly where you want. Pinpoint control – Glavine only throws two pitches, but has tremendous command of both. Compare that to a high school pitcher who has 4 pitches in his repertoire but can’t hit spots with any of them more than 50% of the time. 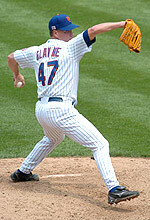 Great change-up – Glavine throws a change-up that is about 10 MPH slower than his fastball and moves. He keeps it down in the zone and on the sides of the plate, so that when it does get hit, it’s a harmless ground ball. Changing speeds – Did I say Glavine threw “A” change-up? I meant to say he threw two. Or maybe three — it all depends on your definition of a change-up. In reality, Glavine purposely throws his fastball at two or three different speeds during a game, and matches each one with a complementing change-up. You will almost never see Glavine throw two pitches in a row at the same velocity. Show pitch – I lied again — he doesn’t throw two pitches, he throws three. Glavine has a curveball in his arsenal, something he rarely threw until two years ago. Even today, he’ll throw it at most five times a game — sometimes not at all. It’s an “extra” pitch he’ll “show” the other team, for the explicit reason to put it in the batter’s head. He may not throw it again for the rest of the game, but the fact that he might is enough to give him an edge and keep the hitters “honest”. Watching Glavine’s pickoff move, you may be disappointed that it isn’t extraordinary. After all, shouldn’t lefties have devastating moves, such as the one Andy Pettitte possesses? It’s true — Glavine doesn’t pick off too many runners. But he also doesn’t allow too many stolen bases, either. He controls the running game by mixing up his moves, holding the ball for varied time lengths, repeatedly throwing over to first, and — most importantly — getting the ball to the plate quickly. As a result, runners do not get good jumps and Glavine gives his catcher a good opportunity to throw out would-be basestealers. Another one of those small things, but an advantage that helps win ballgames. Tom Glavine fields position exceptionally well — if it weren’t for his former teammate Greg Maddux (another pitcher who does EVERYTHING well), Glavine might have a few Gold Glove awards. Glavine’s follow-through puts his body in position to field the ball easily, so he gobbles up ground balls hit back to him and pounces quickly on bunts. Just as important, he completes the play — properly setting his feet and making an accurate, strong throw to the intended target. It seems like a little thing, but the little things add up. Watch one of Glavine’s games and you’ll see him make at least three or four plays that most other pitchers don’t. As a pitcher, every out counts — regardless of whether it’s a strikeout, a popup, or a ground ball. If you as a pitcher can take care of five or six outs a game, it’s as good as adding those outs to your strikeout total. There’s something else about Glavine’s defense that gets forgotten, and is largely unnoticed — he’s always backing up bases. Too often, you’ll see pitchers throw a ball, watch it get hit somewhere, then stand on the mound motionless. I see it at every level from little league to the big leagues, and don’t understand it. There is absolutely nothing a pitcher can contribute to a play by remaining on the mound after the ball is pitched. Don’t just stand there — do something! If it’s not covering first then it has to be backing up a base. Glavine knows which base needs to be backed up and hustles there immediately. It’s possible you’ll back up a base 99 times and it not make a difference, but that 100th time could mean the ballgame. To field well, by the way, is completely up to you. 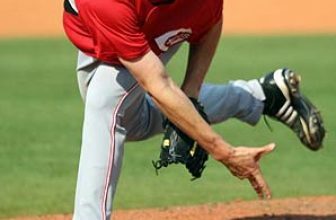 You don’t need any special skills to be an excellent fielding pitcher. All it takes is hard work and plenty of repetition. You have only yourself to blame by not handling those 3-5 outs per game — not to mention making your outing that much more difficult. In the age of the Designated Hitter, and pitchers specializing on the mound at a very early age, it’s rare to see a good-hitting pitcher at the Major League level. And although Tom Glavine has never batted .300 — heck, he usually struggles to bat .200 over the course of a season — he has won 4 Silver Slugger awards and is well-respected as a threat at the plate. Why? Mostly because he has laid down the most sacrifice bunts in MLB history — well over 200 and counting. Again, it seems like a little thing, but how often does a runner bunted to second come around to score? How often has a failed sacrifice attempt impaired a team’s ability to garner a run? Like defense, bunting is an art that requires little skill — it’s all about using the proper technique and repeating it over and over. Kind of boring, to bunt the ball 40-50 times instead of swinging away during batting practice — but Glavine knows his skillset and the importance of execution. 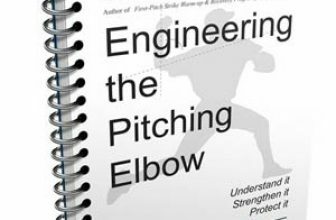 Any batter — be it a pitcher, infielder, or outfielder — can and should become adept at bunting. But Glavine doesn’t only bunt, he also handles the bat fairly well for a pitcher. In his younger years, he hit in the .220-.240 range — better than some position players — and has a knack for getting the bat on the ball. As a result, his managers have been confident calling the hit-and-run when he’s at the plate, creating more scoring opportunities. Glavine also has a keen sense of the strike zone as a hitter, and forces the opposing pitcher to throw pitches. Since he’s not looking to hit the ball over the fence, Glavine will often take a strike — or two — then foul pitches off with a short, choppy swing. Again, doesn’t seem like a big deal, but every pitch he makes the opposing hurler throw is one more away from being removed from the game. Anyone who has watched Glavine through the years can see that he carries himself as a winner. If all you do is watch his stuff — which isn’t particularly extraordinary — you might come away thinking, “how the heck did this guy win 300+ games?”. Don’t feel bad — even Albert Pujols was scratching his head after a 2006 NLCS loss, telling the press after the game, “He wasn’t good. He wasn’t good at all.” Pujols was right — if he was talking only about Glavine’s stuff. But Pujols, like many, didn’t “see the forest for the trees”, as they say. The bottom line is, Glavine knows how to win, and knows that if you do every single little thing, they all add up and can be the difference in a ballgame. If you have an opportunity, watch Tom Glavine this year (he may be retiring). You can learn quite a bit by watching EVERYTHING he does on the field.